I’m sick of folk flipping out over Adele as if she is that standard under which all over voices should be evaluated. Her voice is not that great. She can sing, She can hold a note. Let’s be honest: if you find yourself at a good Black Baptist church on any Sunday, you’ll be able to find somebody that could belt Adele under the table. The same goes for the music business. There is an abundance of black singers that can slay you straight to your soul that get little to no support whereas flimsier white artists like Meghan Trainer have everybody in their corner. There is no better example of this than Adele. She has a good voice. She is a talented writer. But not moreso than criminally slept on Tank. Not moreso than R&B fundamentalist Tyrese. Still, both crooners have at a minimum pondered retiring from music altogether due to the lack of support they’ve received. It’s time we stopped acting like Adele is serving soul like a those Emerald City dancers from The Wiz Live!. Adele gets away with being mediocre in the music industry because she is soulful by white standards. Don’t believe me? Check these 9 artists below and let me know if Adele has ever performed near these standards. Whitney Houston commanded the 1994 AMAs stage with a medley of “I Loves You Porgy”/”And I’m Telling You”/”I Have Nothing”. Who else you know that can take 3, count ’em 3, black standards to a non-black awards show and fully captivate the entire audience? That’s why Whitney is known as “The Voice”. Whitney took The Star Spangled Banner, the United States National Anthem and a song that the most backwoods folk in our nation hold dearest to their hearts, and made it her own just like Serena stole tennis. Before she was an actual recording artist, Fantasia went down in history for her performance of “Summertime” on American Idol. With her shoes off and sitting on the edge of the stage, Fantasia earned her American Idol crown weeks before the season was over. When you put together a tribute for Patti Labelle, you can’t just book any singer. You need a sanger. And Fantasia fits that bill. She took her performance of “Lady Marmalade” from the stage to the audience to a dance with Patti and back, snatching wigs all along the way. 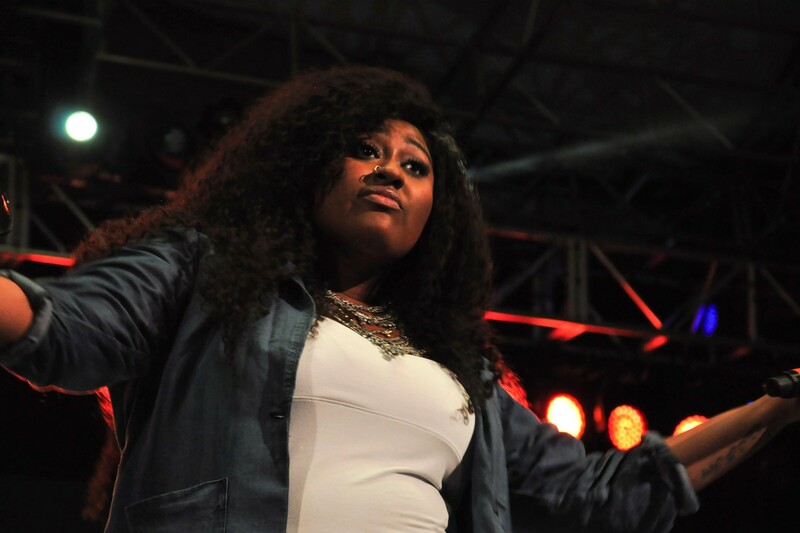 There is plenty of material I could pull showing Jazmine Sullivan blowing the roof off of venues. But to further prove my point that Adele is mediocre in comparison to the bevy of black artists in the industry, I’m not going to share one of her current performances. Instead, I’ve goe an 11 Year Old Jazmine Sullivan singing “Home” From The Wiz. At 11(!) Ms. Sullivan could already blow back Adele’s coif. When I think of slept on vocalists, Tamia always shows up on my list. Do you even know of anybody else that can sing “You Put A Move On My Heart”? That takes range and power of voice that only a precious few are blessed with. But while visiting the Steve Harvey Morning Show, Mrs. Hill sang a collection of her hits and then capped the whole affair with a cover of Anita Baker’s “Been So Long”. Don’t try this at home folks. Just like Fantasia, Jennifer Hudson was a force to be reckoned with on American Idol. Despite the hate she received from judges week in and week out, she proved again and again that she’s got the pipes. “Circle of Life” will have you testifying the goodness of God’s grace. “Weekend In New England”, on the other hand, showed that she was a performer that didn’t have to just rely on belting out notes at the top of her range. She could do tender too. And even though she ended up getting voted off of the show after this performance, it was also a sign of the superstar that we’d see blossom in the coming years. You don’t sing live on Soul Train. It was a rule. No matter who you were, you performed to a prerecorded track. But not Luther. Luther sings live. And when he pulls out “A House Is Not A Home” and starts those ad libs, you know you better get ready. I’m just waiting for Luke James to get the respect he deserves. His breakout hit “I Want You” was an instant classic. But for his debut self-titled album, he included a cover of Sam Smith’s “Stay With Me”. To me Sam Smith is just like Adele, and this comparison makes that clear as day. “Sweet Lady”. “Lately”. “Stay”. Tyrese has been true to soul music from the start. And his recent (and final) album Black Rose further cemented his dedication to the genre. “Shame”, the lead single off of the album, was already a soul monster on its own. But watching him perform the song with Patti LaBelle at her house? I need a nap.